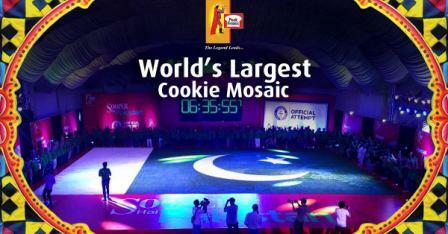 Pakistan has broken the Guinness World Record for the largest cookie mosaic. It was made in the shape of the national flag, the Dawn reported. According to the report, the cookie mosaic was made by Peek Freans Sooper on the occasion of the 70th Independence Day of Pakistan. The flag was made with more than 150,000 cookies in green and white and measured 2,438.15 square feet. It was completed in 6.5 hours. The mosaic covered an approximate area of 226 square meters. After completion, all cookies used in the mosaic were distributed to notable charities in Pakistan. The event of creating the cookie mosaic was held in Islamabad under the supervision of officials of Guinness World Record. After the measurements were taken at the venue, the results were announced by the Guinness World Record officials, the report said. Apart from the team, leading celebrities like Younis Khan, Shoaib Akhtar, Osman Khalid Bitt, Mira Sethi, Adnan Siddiqui and Hareem Farooq were present. The celebrities not only encouraged the 200 employees of the cookie manufacturer, they also actively took part in the creation of the mosaic as it was being made on the stage.